Mark E Smith described “the Midlands mentality” in ‘Kimble’. Robert Lloyd has always had that in spades, from the punk days of the Prefects to the Nightingales (first time round), through his Vindaloo label and solo career (remember the great ‘Power of the Anchor’ single?) 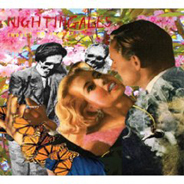 and back again to the Nightingales, who reformed in 2004. Like Smith, Lloyd is the charismatic frontman/ choirleader/ taskmaster who makes it all happen for his band and I’m pleased to report that Insult to Injury is probably as good as the Nightingales have ever been. It’s certainly, by some distance, the best of their post-reformation albums, with the same maverick mix of post-punk, Krautrock, skronky Beefheartian rhythms, rockabilly looseness plus Lloyd’s poetic observations on the absurdity of everyday life. ‘I Am Grimaldi’ is a magnificent starting point, with its wheezy accordion blasts and shards of Lloyd’s skewed wisdom: “if you keep on walking into a barbers, one day you’re gonna get a haircut”. That sets the tone, although seven and a half minutes of the spiky ‘Big Bones’ are a few minutes of discordance too much. The variety of the record impresses; from the rockabilly ‘Little Lambs’ and Fall-ish ‘Old Fruit’ to the music-hall-meets-alt.country ‘Former Florist to the Queen’ and the addictive post-punk ‘Watch Your Posture’. Lloyd lyrically is at his best too, describing characters like “Kirklees Ken” and imparting facts about the Julian calendar and St Johnstone FC, where he sounds as much novelist as lyricist. This isn’t just an 80s band doing good but it’s a fine record period, and puts most contemporary (and younger) “post-punk” bands to shame.